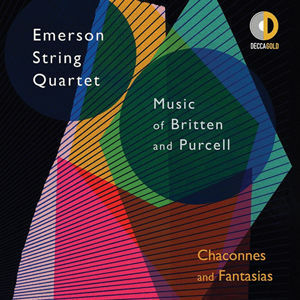 Chaconnes And Fantasias - Music Of Britten And Purcell | Emerson String Quartet | Kirshbaum Associates Inc. Celebrating its 40th anniversary, the Emerson String Quartet releases Chaconnes and Fantasias Music of Britten and Purcell. Exclusively featuring repertoire never before recorded by the quartet, the album comprises Britten's String Quartets Nos. 2 and 3 as well as a selection of chaconnes and fantasias from Purcell, including Chacony in G Minor, Z 730 and Fantazia No. 11 in G Major, Z 742. This is the ensemble's first feature recording including cellist Paul Watkins, who joined in 2013.